There is nothing like friends to share recipes, love and time with. Thank you Elaine for your recipe, Last Minute Meat Balls with Mushroom Gravy. That is a great recipe for something comforting and everyone would love. Thanks for sharing it! I am pleased you included my recipe in your book. The book looks delicious. Thanks for the inclusion. Awwwe! Thank you Amy! Your so sweet! Love your recipes as you can tell! :) Hugs back! Thank you so much for adding my recipes!! You always make the nicest cook books Tammy! ~Hugs! Your welcome Garrison. Thank you for the recipe! Aww, that is so sweet! I love your recipes too, and I need to do another cookbook, speaking of which. 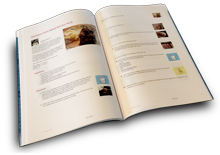 I am so honored, Tammy, that you have included two of my recipes in your wonderful cookbook--this book has everything! Awwwe, I'm so glad you shared his recipe! I have a grill this year and I want to try his recipe. So excited! Thank you! Tammy, Uncle Bob would be so proud. He fancied himself the BBQ King at all of our family gatherings. Thank you for including his Kabobs in your book. LOL Tammy! You are so funny, but you will love this dessert if you do get a chance to make it! Your welcome Jeanne! I'm glad you like the book! I really like this one too! Thank you so much for sharing your pie recipe! My eyes about came out of my head when I saw it! Got to make that! YUM!